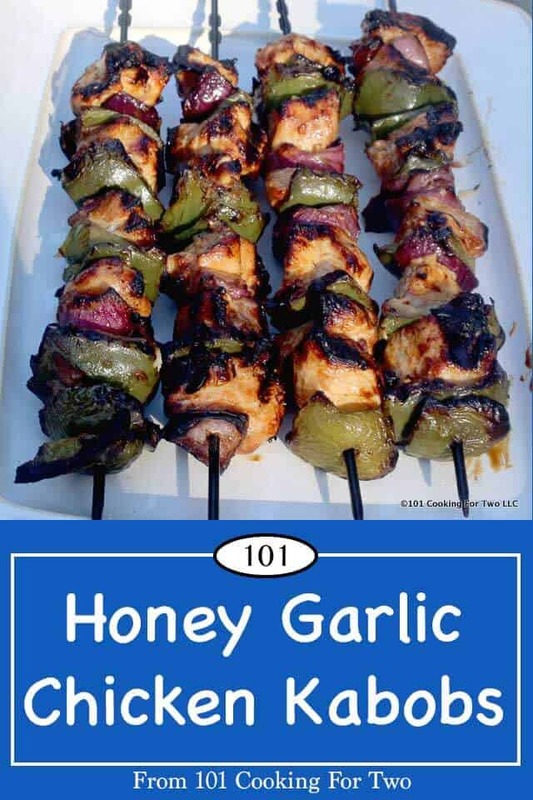 These succulent honey garlic chicken kabobs start with a simple marinade which makes them something special. They will become a standard at your home all summer long. 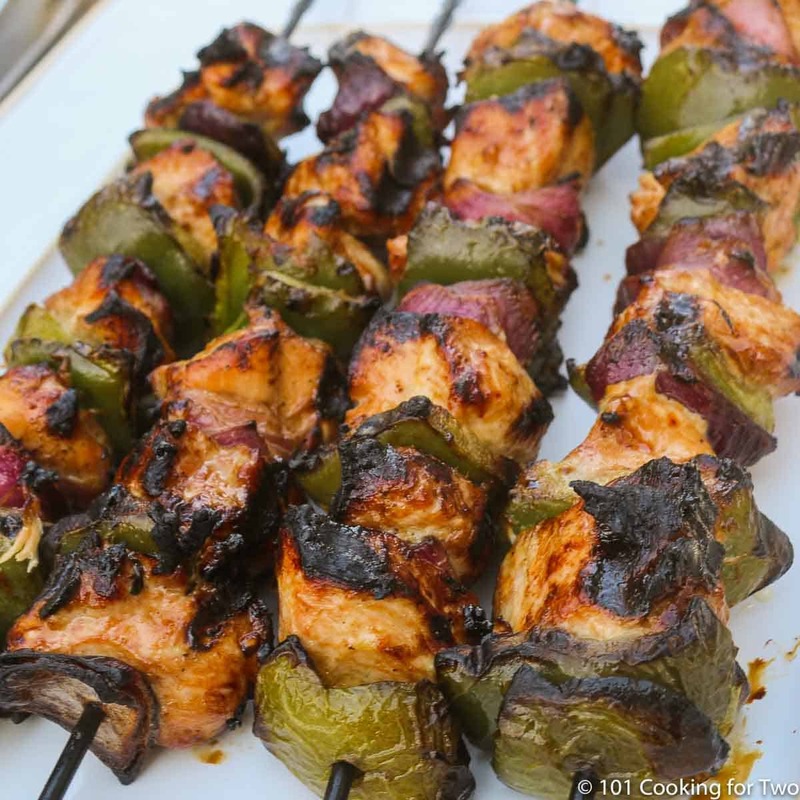 There are a lot of things to love about these kabobs. 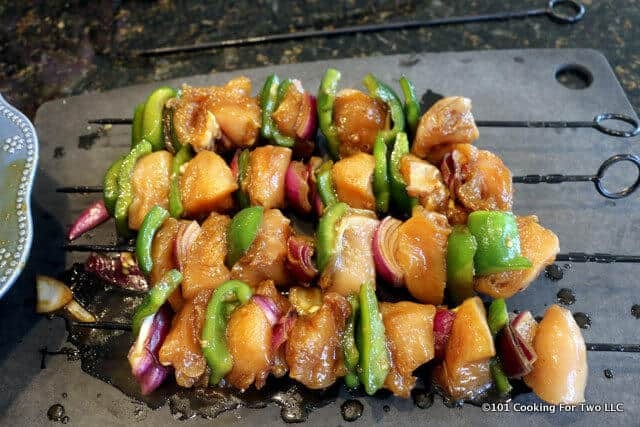 A bit of honey for just the right sweetness and kicked up garlic what will make a garlic lover happy but mostly it is the tender chicken and charred veggies that send this over the top. Roughly based on an Allrecipe.com recipe but I backed off the honey and soy sauce a tad and pumped up the garlic. I find many recipes crank up the honey too much for my taste. And I backed off the soy some to keep the sodium down but could have used a lower sodium soy sauce for even more decrease in sodium. I do love a good kabob. I say lower end of five. Notes: This is a recipe that is crying to cut in half for two servings. We had company, and I needed four. So pictures were for four, so I wrote it that way. The ingredients are things I almost always have in the house. Prep veggies. I went with two peppers (any color will do) and two medium red onions. Chop into chunks. 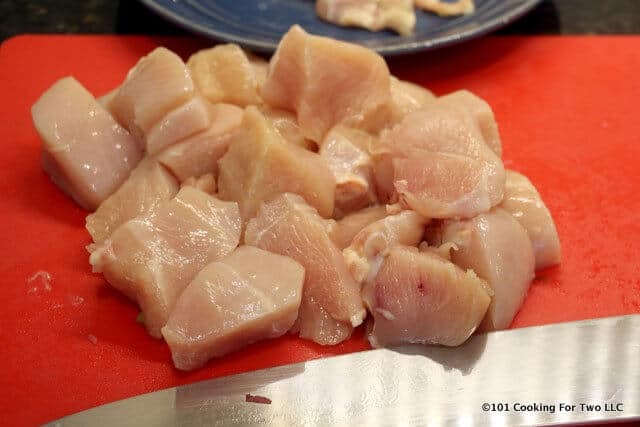 Trim two pounds of skinless boneless chicken breasts and chop into 1-inch chunks. 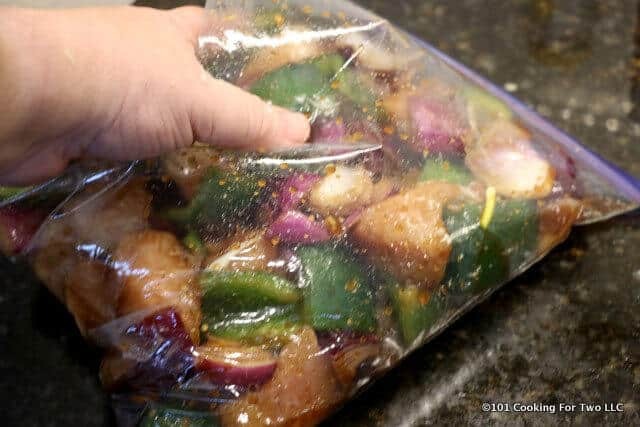 Add the chicken and veggies to a one-gallon ZipLock bag. Add 1/4 cup olive oil, soy sauce, and honey. Add 1/2 teaspoon pepper and four cloves of garlic crushed. 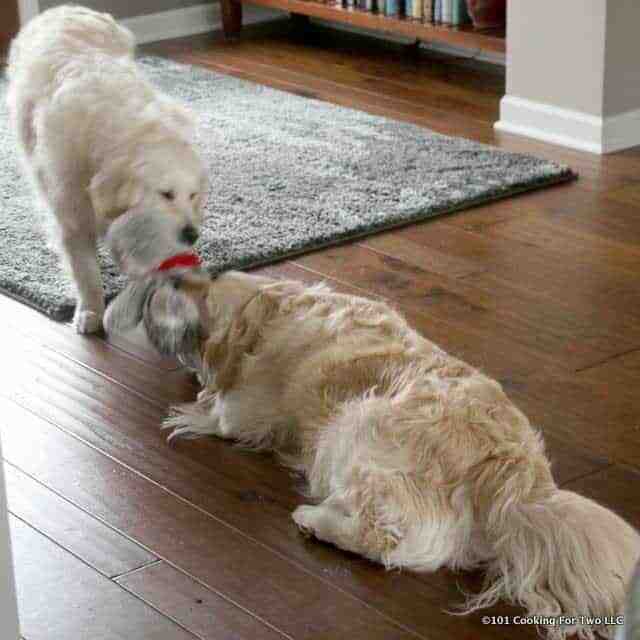 Seal bag and mix well. Refrigerate for 30 minutes to 2 hours. Preheat grill to 450-500 surface temperature. Medium for me but more like medium-high on most gas grills. 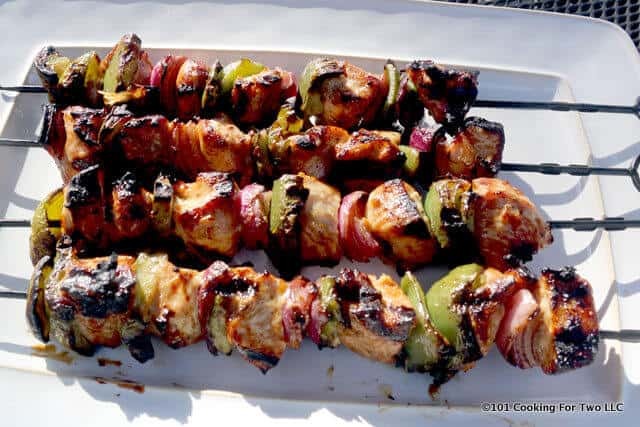 Place meat and veggies on kabob skewers. Grill over direct heat. Rotate 1/4 turn every 6-7 minutes. 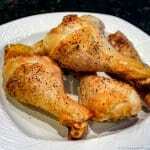 Cook until internal temp of the chicken is 165 degrees. Check the thickest pieces near the center of the kabobs. Total cooking time 25-30 minutes. Prep veggies. I went with 2 peppers (any color will do) and two medium red onions. Chop into chunks. 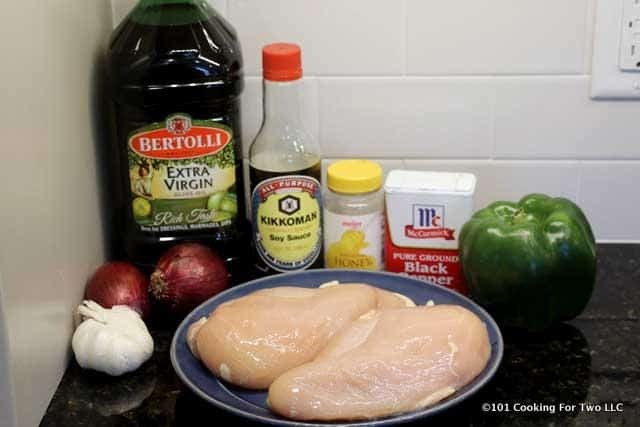 Trim two pounds of skinless boneless chicken breasts and chop into approximately 1-inch chunks.Add the chicken and veggies to a one gallon ZipLock bag. Add 1/4 cup olive oil, soy sauce, and honey. Add 1/2 teaspoon pepper and four cloves of garlic crushed. Preheat grill to 450-500 surface temperature. Medium for me but more like medium high on most gas grills. 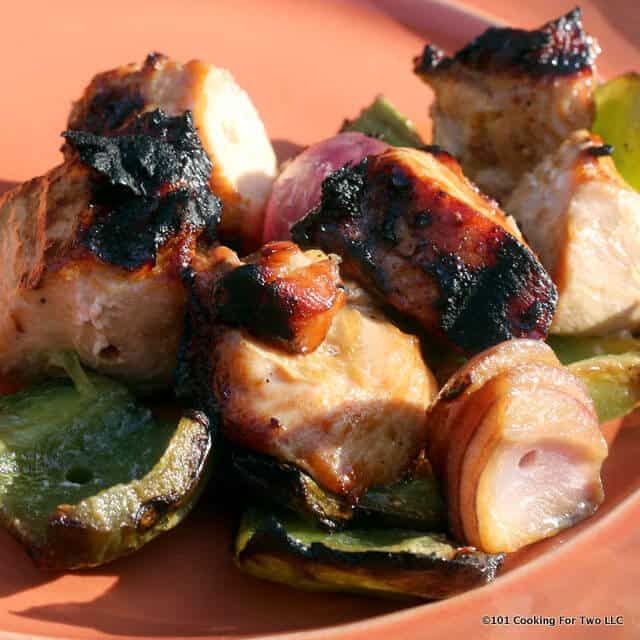 Place meat and veggies on kabob skewers. 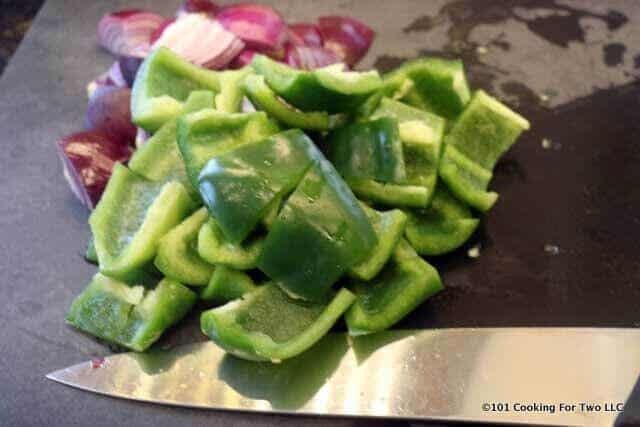 This recipe is ideal for cutting in half and making two servings. We were having company so I did 4. As expected this was delicious!! I’ve found its easier & less messy to put everything on the skewers before I marinating. Depending on how big I’m making them I may have to marinade in a pan instead of a bag. Thanks for your great recipes!! 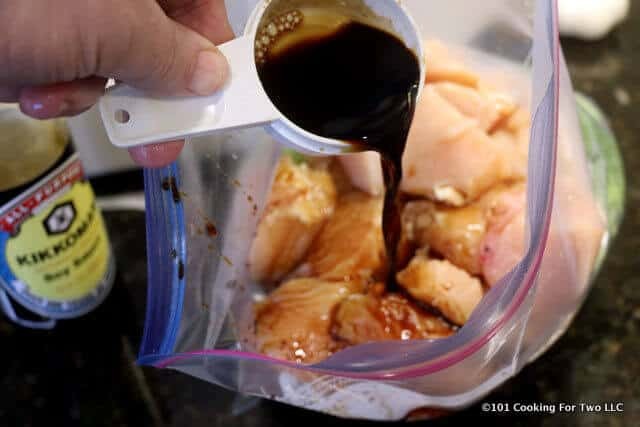 I have a tupperware container specifically made for marinading. But I had something else in it plus I try to do a technique the readers can follow, so the bag won. So you don’t like chicken stuff on your fingers…. 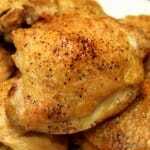 Hmm so tasty, thank you for share this recipe, so i can try it at home. Sounds delicious as many of your recipes. 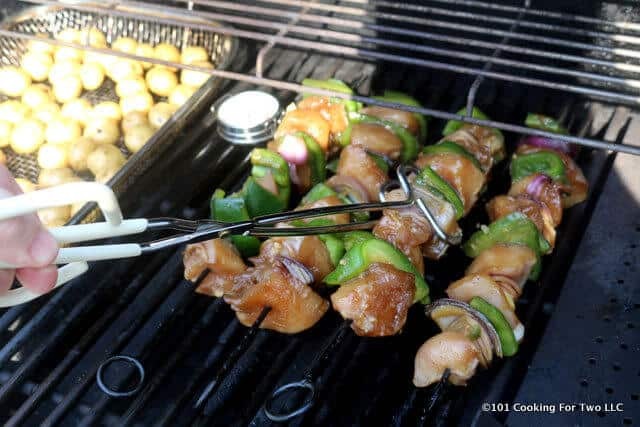 I see in the photo looks like you are grilling small potatoes in the pan next to the skewers. Do you have a recipe for those? I never know whether to parboil or not and seasonings. Thank you! Hi Cindy, Thanks for the comment. The potatoes are something my wife brought home are called “tiny potatoes”. They are white skinned and about 1 inch to a little less. No real instructions came with them so I made it up. Since I was controlling the surface temp in this recipe at 450, think of it as an oven. 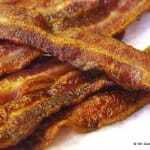 So I coated with olive oil and gave them a good coating of my 7:2:2 (see Food FAQs in the menu). Into a grill pan and stir when I flipped the kabobs every 6-7 minutes. At about 15 minutes I added a couple of cut up squash. Cook another 10-15 minutes and everything was done just as the kabobs were done. I know somebody was going to ask.